As protesters were milling around, enjoying live music and the colorful, imaginative costumes, the Black Bloc or “Casseurs” (looters) arrived. Around 10 Casseurs ran towards the GJs, dressed head to foot in black and with their faces covered. They pushed a woman to the ground and ran over her. The atmosphere changed immediately: the GJs started to chant “Degages” or “get out” and I could hear shouts from the organizers calling for calm and no violence. Just before the Place de la Republique, the victims of previous police violence were diverted down a side street as news had reached the march that tear gas was already being used in Place de la Republique less than 200 meters away. Most marchers told me this was following the pattern of previous marches so the priority was to protect the injured from any further harm. Marchers had joined hands in a circle around the injured as a symbol of protection and solidarity and they opened the circle to allow the safe exit of their comrades. On the February 5, French MPs voted to pass the repressive Loi anti-Casseurs (the anti-looting law). Reaction on social media from the GJs and their supporters has been swift to condemn what they judge to be another attack on their constitutional rights and their liberty to protest injustice. The law has the full support of Interior Minister Castaner and his Macroniste acolytes. A minority in Parliament consider the new law to be a threat to civil liberties. Emmanuel Macron was elected by the neoliberals, the globalists and capitalist elite to protect and expand their interests worldwide. Macron was not elected to represent the majority of his people, he was maneuvered into position to protect the banking cabals and their interests. Macron’s bubble has burst on the sword of dissent. The Gilets Jaunes have exposed Macron for what he really is: an instrument of power on the global stage who will not be allowed to deviate from his machiavellian road map. Under Macron, France is rapidly being plunged into plutocracy and totalitarianism and the French people are pushing back. 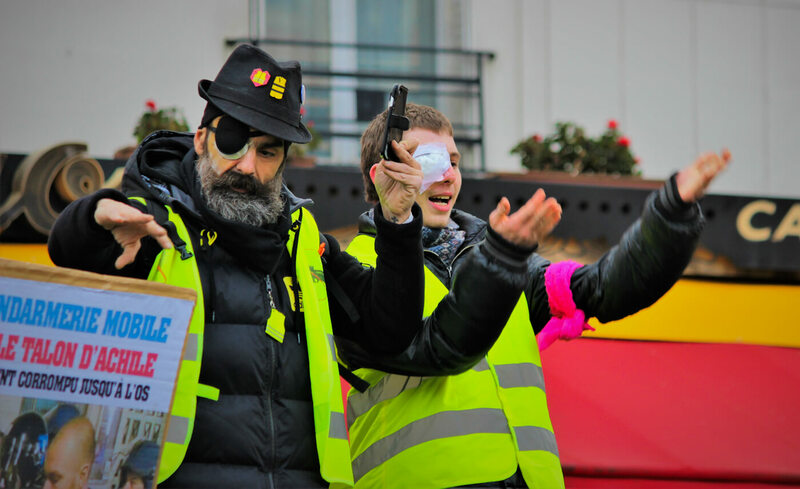 The GJ movement has kicked Macron’s hornets’ nest and what we are witnessing is the turning of the jackboot of power and tyranny against its own people — “the little people” who are of no consequence to the giants among the ruling elite, the wealthy, the privileged who profit from the spilling of blood at home and abroad, where their military adventurism has resulted in the deaths of millions of “little people” in Iraq, Yemen, Syria, Libya, Central Africa and is now threatening Venezuela. Next Article Recession. Revolution. Recovery.